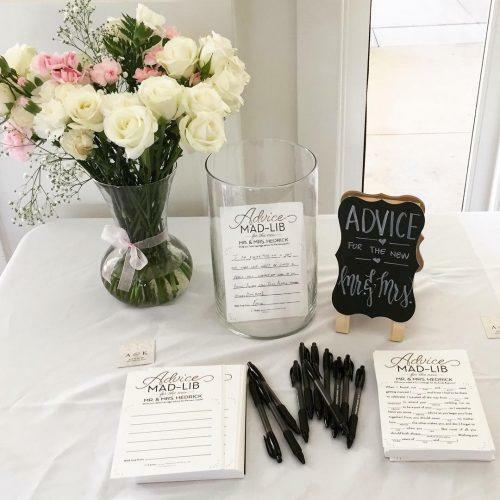 Wedding mad libs are a great way to have fun at your bridal shower, reception, or even printed on your invitations so that your guests can play at home. It’s always popular to provide a series of wedding shower games for hours of fun. Mad Libs fits right in with bridal shower bingo and many other ‘nuptualized’ classic games. We’ll walk you through several variations to keep your guests entertained throughout your various events. We’ll also give you a few hints to make sure that the game goes off without a hitch, and that you save a few dollars along the way. Tell a story which takes up half of a normal sheet of paper. Remove some key adjectives, verbs, and nouns to leave some blanks. Without having seen the story, have the players insert their own words. Once all of the blanks have been filled read it out loud! As you can see, this innocent phrase about “What Mom Used to Say” quickly turns into hilarity with a few unexpected words. 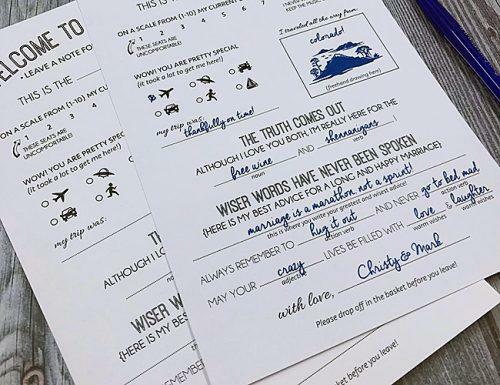 Expect wedding-themed fun like this when you present your guests with a game of bridal shower mad libs! The first version of wedding mad libs should be played at the reception. This version tells the story of the happy bride and groom and their journey of becoming husband and wife. This should be written to include how they first met, an anecdote about their dating history, and (of course) how he popped the question. Feel free to add in a little bit about who the bride and groom are. This can include where they work, where they went to school or something about their families. Really, anything you feel comfortable sharing that contributes to “their story” should be considered. When writing each sentence, make sure that the nouns and adjectives are ‘changeable’. Not every sentence will end up making sense if you change some keywords. So, before you print off the whole batch, test your mad libs sheet out on a friend. Ask them for their choice of words, fill in the blanks and see if you have a winner! Leave the printed out Mad Libs cards at the tables. As your guests arrive and celebrate throughout the night, there may be some downtime that needs filling. Your Mad Lib cards will be a welcome activity to fill this time. Later on in the evening, assign one of your bridal party to collect the cards and go through them to find the most hilarious submission. This can be read out loud to provide some much appreciated comedic relief in between scheduled speeches and toasts. Bridal shower mad libs are very similar to the version you can play at the reception. However, this party is typically filled with much closer friends who will know you better. This allows you to be a little more specific with your mad libs sheets. All of your guests for the reception come from all over, and they may not know how you first met or what the groom does for a living. But, your bridal shower party will know more about the intimate details. 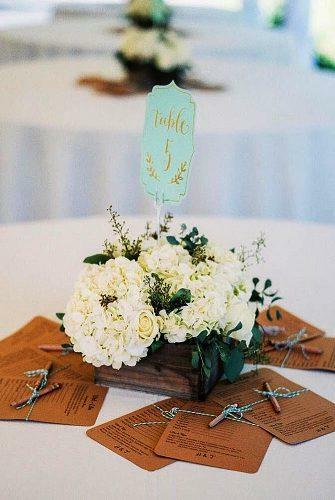 A more specific story means a greater connection to the bride and groom which makes everything more fun! You can step things up a notch by having the party fill in the blanks anonymously before turning them into the host. The host can then read them aloud and have everyone take a guess at who wrote down the answers. However wrote the best mad lib will get a prize, with another prize going to the individual who made the most correct guesses. Bachelorette mad libs are a little different. The wedding reception includes friends and family of all ages, so you MUST keep the game PG. However, your bachelorette party is more likely to be restricted to close friends within your own age range. Speaking of “him”, mad libs are a fantastic idea if you’re trying to plan an inexpensive bachelor party. The days are of casinos and strippers are long gone with many grooms preferring to spend some quality time with the boys up at the cabin. Mad libs, and games like them, are an entertaining way to pass the time while the guys enjoy each other’s company. Check back with WeddingForward often. We have tons of ideas, big and small, to help you with every step of your Happily Ever After journey.